CAPE TOWN, South Africa, January 14, 2013 (ENS) – Multiplatinum-selling South African rock band The Parlotones Sunday brought onstage a life-sized art piece in the form of a lion, painted by drummer Neil Pauw to dramatize the plight of real-life lions. There are as few as 25,000 left in the wild in Africa today. The lion, panthera leo, is classed as Vulnerable to extinction by the International Union for the Conservation of Nature, IUCN, on its authoritative Red List of Threatened Species. Lions are classified as regionally Endangered in West Africa. Named ‘Hollish,’ the lion statue accompanied The Parlotones on stage at Kirstenbosch National Botanical Garden in Cape Town, which features open-air concerts on summer Sundays. A well-known artist in his own right, Pauw designed and painted The Parlotones’ lion statue in a red, yellow and black abstract design. Hollish is one of a pride of more than 30 life-size lion statues being painted at the Lions’ Den on Cape Town’s famous V&A Waterfront at the foot of Table Mountain in the heart of the working harbor, where more than 80 restaurants, indoor shopping and entertainment venues draw local residents and visitors alike. Before their concert, The Parlotone appeared Sunday at the official opening of the Lions’ Den to pick up Hollish and view the other lion statues in various stages of completion. The Parlotones’ lion ‘Hollish’ will be on parade with the other lions on the V&A Waterfront starting in March through to May this year. Later, the ‘Pride’ will be auctioned off in aid of international wildlife charity the Born Free Foundation, for their work to raise public awareness of the plight of wild lions and help sustain the remaining wild lions. The funds will help Born Free to preserve lions in their natural habitat, and funds will be dedicated to care for those individual lions the charity has rescued from lives of misery in captivity. All the unique and colorful lions will be painted at the Lions’ Den, giving the public an opportunity to see the artistic process up close. A call has gone out to the artist community of Cape Town to design and help paint the lions and join the existing artistic team working on this landmark public arts project for the city. Many of the lion statues are sponsored by local, national and international businesses such as Coca-Cola, Land Rover, Shamwari Game Reserve, South African Airways and Red Bush Tea. The ‘Pride’ project was officially launched in March 2012 with a concert by legendary Queen guitarist Brian May and English actress and singer Kerry Ellis. 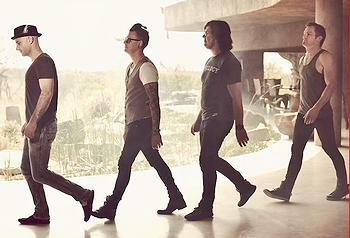 Originally from Johannesburg, The Parlotones have recently relocated to Los Angeles, California.